This book was given the title: “al’Jaami’ as-Saheeh” by its author. In it, he recorded six hundred thousand Hadeeth and he exerted great effort in revising them, editing them, and scrutinizing them to determine their authenticity. He was so concerned that he would not place any Hadeeth within his collection without first washing and praying to units of prayer seeking Allaah’s guidance in the decision to include it. He did not include any report or narration unless it was authentically reported from the Messenger of Allaah (صلّى الله عليه وسلّم) with a clear, connected chain of narrators, all known for their trustworthiness and preciseness. He completed his work over a span of sixteen years. After which, he presented it to Imaam Ahmad, Yahyaa Ibn Ma’een, ‘Alee Ibn al-Madeenee, and others. They admired it and approved of it and attested to its authenticity. This collection consists of seven thousand, three-hundred ninety-seven (7,397) Hadeeth including the ones that are repeated, yet placed in different chapters. Excluding the repeated Hadeeth, there are two thousand, six hundred two (2,602) individual Hadeeth as al-Haafith Ibn Hajar pointed out. He is Abu ‘Abdullaah Muhammad Ibn Ismaa’eel Ibn Ibraaheem Ibn al-Mugheerah Ibn Bardizbah  al-Ja’fee, originally of Persian origin. He was born in Bukhaaraa (in present-day Uzbekistan) in the month of Shawwaal (the 10th month of the Islaamic calendar) in the year 194 Hijrah. He was raised as an orphan (without his father) in the care of his mother. He began traveling throughout different lands, seeking out Hadeeth in the year 210. He resided for six years in various lands including ash-Shaam (the lands of Palestine, Syria, Jordan, etc. ), Egypt, the Arabian Peninsula, Basra, Koofah, and Baghdad (all three in Iraaq). He was very proficient in memorizing and it was even said that he was able to memorize a book after seeing it only once. He was one who abstained from useless worldly things. He was pious and did not mix much with the kings, princes, or leaders. Yet, he was brave and generous. Scholars of his time and thereafter have praised him. Imaam Ahmad said of him, “No one even close to him has ever come from (the land of) Khuraasaan.” Ibn Khuzaymah said, “There is no one under the sky more knowledgeable of Hadeeth of Allaah’s Messenger (صلّى الله عليه وسلّم), nor one having memorized more than Muhammad Ibn Ismaa’eel al-Bukhaaree.” He was also diligent in deducing rulings and had an amazing ability to derive rulings and benefits from Hadeeth as can be witnessed from the manner in which he organized his authentic collection. He died in a place known as Khartank near Samarqand (in Uzbekistan) on the night of ‘Eed al-Fitr (the Islaamic holiday to conclude fasting in the month of Ramadhaan) in the year 256 Hijrah. He was thirteen days away from the age of sixty-two years old. He left an enormous amount of knowledge behind in his writings. May Allaah have mercy upon him an reward him on behalf of his contribution to the Muslims. Bardizbah: A Persian word meaning cultivator or someone who grows crops. [101:1] Al-Qâri’ah (the striking Hour, i.e. the Day of Resurrection). [101:2] What is the striking (Hour)? 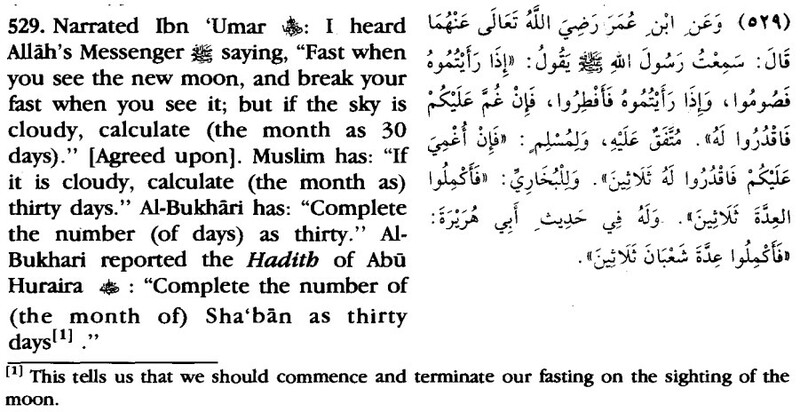 [101:3] And what will make you know what the striking (Hour) is? [101:4] It is a Day whereon mankind will be like moths scattered about. [101:5] And the mountains will be like carded wool. [101:7] He will live a pleasant life (in Paradise). [101:9] He will have his home in Hâwiyah (pit, i.e. Hell). [101:10] And what will make you know what it is? [101:11] (It is) a fiercely blazing Fire! Al-Qari`ah is one of the names of the Day of Judgement, like Al-Haqqah, At-Tammah, As-Sakhkhah, Al-Ghashiyah and other names. (And the mountains will be like wool, carded.) meaning, they will become like carded wool that has began to wear out (fade away) and be torn apart. (Then as for him whose Balance will be heavy.) meaning, his good deeds are more than his bad deeds. (He will live a pleasant life.) meaning, in Paradise. 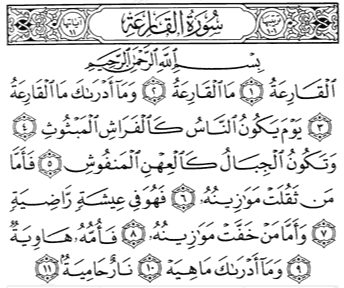 This is the end of the Tafsir of Surat Al-Qari`ah, and all praise and thanks are due to Allah. And (remember) when We made the House (the Ka’bah at Makkah) a place of resort for mankind and a place of safety. And take you (people) the Maqam (place) of Ibrahim (Abraham) [or the stone on which Ibrahim (Abraham) stood while he was building the Ka’bah] as a place of prayer (for some of your prayers, e.g. two Rak’at after the Tawaf of the Ka’bah at Makkah), and We commanded Ibrahim (Abraham) and Isma’il (Ishmael) that they should purify My House (the Ka’bah at Makkah) for those who are circumambulating it, or staying (I’tikaf), or bowing or prostrating themselves (there, in prayer). (Our Lord! And accept my invocation). (Verily, the first House (of worship) appointed for mankind was that at Bakkah (Makkah), full of blessing, and a guidance for Al-Alamin (mankind and Jinn). In it are manifest signs (for example), the Maqam (place) of Ibrahim; whosoever enters it, he attains security) (3:96-97). Al-Qurtubi mentioned this, but he considered it unauthentic, although others gave it prefrence, Ar-Razi reported it in his Tafsir from Al-Hasan Al-Basri, Qatadah, and Ar-Rabi bin Anas. Earlier, the Maqam was placed close to the Kabah’s wall. In the present time, the Maqam is placed next to Al-Hijr on the right side of those entering through the door. Umar was also the person whom the Qur’an agreed with regarding praying next to Maqam of Ibrahim. This is why none among the Companions rejected it when he moved it. Abdur-Razzaq reported from Ibn Jurayj from Ata’, “Umar bin Al-Khattab moved the Maqam back.” Also, Abdur-Razzaq narrated that Mujahid said that Umar was the first person who moved the Maqam back to where it is now standing.” Al-Hafiz Abu Bakr, Ahmad bin Ali bin Al-Husayn Al-Bayhaqi recorded A’ishah saying, “During the time of the Messenger of Allah and Abu Bakr, the Maqam was right next to the House. Umar moved the Maqam during his reign.” This Hadith has an authentic chain of narration. O mankind! Worship your Lord (Allah), Who created you and those who were before you so that you may become Al-Muttaqun. O you who believe! Seek help in patience and As-Salāt (the prayer). Truly! Allah is with As-Sābirīn (the patient ones, etc.). There are several types of Sabr ـ patience: one for avoiding the prohibitions and sins, one for acts of worship and obedience. The second type carries more rewards than the first type. There is a third type of patience required in the face of the afflictions and hardships, which is mandatory, like repentance. ارْتَحَلَتِ الدُّنْيَا مُدْبِرَةً، وَارْتَحَلَتِ الآخِرَةُ مُقْبِلَةً، وَلِكُلِّ وَاحِدَةٍ مِنْهُمَا بَنُونَ، فَكُونُوا مِنْ أَبْنَاءِ الآخِرَةِ، وَلاَ تَكُونُوا مِنْ أَبْنَاءِ الدُّنْيَا، فَإِنَّ الْيَوْمَ عَمَلٌ وَلاَ حِسَابَ، وَغَدًا حِسَابٌ وَلاَ عَمَلَ. 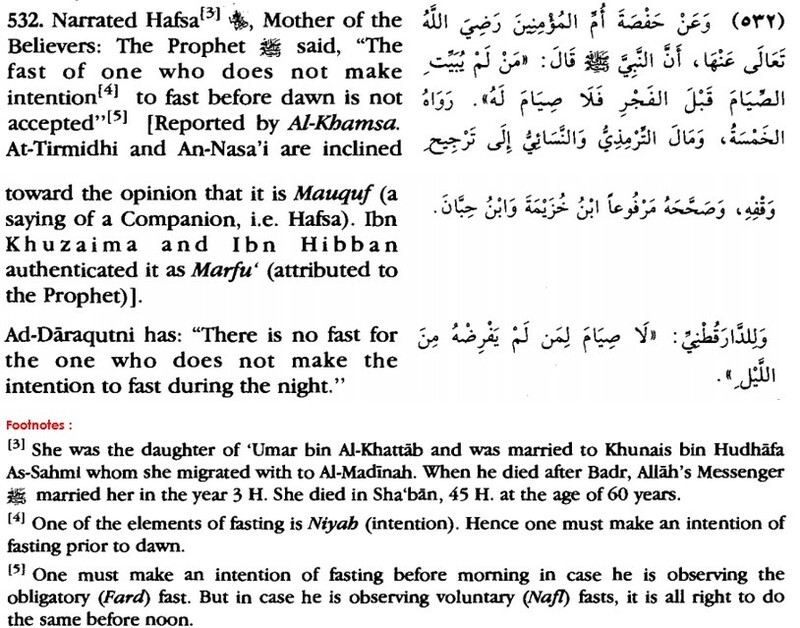 We are thus informed that the eating or drinking out of forgetfulness does nor invalidate fasting. Neither one is obliged to observe a compensational fast (Al-Qadâ) nor pay any expiation.